Developer Haysha Deitsch recently filed permits to demolish 243 and 245 Fourth Ave., where he plans to construct an 11-story building. Deitsch also owns the Prospect Park Residence assisted living facility. PARK SLOPE — The developer known for abruptly kicking more than 100 seniors out of a Park Slope assisted living facility is moving forward with plans to build a luxury high-rise elsewhere in the neighborhood. 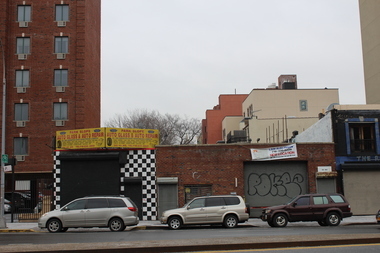 Developer Haysha Deitsch filed demolition permits this week for 243 and 245 Fourth Ave., two auto body shops he plans to tear down and replace with an 11-story building with 16 residential units, a private roof deck, a pet spa and a children's playroom. Deitsch's new Fourth Avenue building, near President Street, will be designed by Karl Fischer, the architect behind the luxury high-rise on Sixth Street and Fourth Avenue in Park Slope. It joins a growing list of tall buildings in the works for Fourth Avenue, which was rezoned to allow for taller development in 2003. More than a dozen buildings are planned for the stretch of the busy avenue that runs between Park Slope and Gowanus. Deitsch also owns Prospect Park Residence, an assisted living facility on Prospect Park West at Grand Army Plaza, where residents in 2014 were given 90 days notice to clear out. Some residents fought the orders to leave and sued the facility and the state Department of Health, which approved the rapid closure. Deitsch had planned to sell the facility to Sugar Hill Capital Partners for $76 million, but the deal stalled because Deitsch was supposed to deliver the property vacant, the Brooklyn Paper reported. Now just a handful of elderly residents remain in the nine-story facility and they're still battling Deitsch in court.